After consistently dominating the English Debating Scenario for the past half-decade, North South University Debate Club set its latest achievement in Bengali debating as well, by winning the Gold Cup at the ATN Bangla Campus Parliament 2011, sponsored by Cambrian College. After nearly a year of preliminary rounds, 2 teams out of the initial 34 made their way into the grand finale. Bangladesh University of Professionals (BUP) was the government team while North South University was opposing the motion. The event was graced by the chief guest, Speaker Abdul Hamid Siddiqe and special guests Dr Mahfuzur Rahman, Chairman of ATN Bangla and Hasan Ahamed Chowdhury Kiron, Director of Campus Parliament. Also present at the event was the Vice Chancellor of North South University, Dr Hafiz G A Siddiqui and Pro Vice Chancellor Dr S A M Khairul Bashar along with faculty advisor Dr M Ashiqur Rahman. After a much heated, competitive, and informative round of debating, the champion team of NSU, comprising of Nasir Uddin, Aumit Rayhan and Syed Iftekhar Towheed became the proud winner of the Gold Cup, as well as a reward of One Lakh Taka. Throughout the tournament, many important national issues were discussed, and a lot of information was presented by both sides. Student Affairs Division, Northern University Bangladesh launched a monthly newspaper 'Pohtikrit'. Nurul Islam Nahid, MP, Minister, Ministry of Education was present on the occasion at NUB's permanent campus on August 13, 2011. Md Saiful Alam Munir, Head, Student Affairs Division is the Chief Editor and Akhtarul Alam Tinu, student of English is the Executive Editor of 'Pothikrit'. Dr Kamal Abdul Naser Chowdhury, Secretary, Ministry of Education and AKM Mojammel Haque, MP, Professor Dr A Y M Abudullah, Chairman, IBAT Trust Board of Trustees, Professor Dr M Shamsul Haque, Vice-Chancellor, M Abu Bakar Siddique, Treasurer, Lt Col (Rtd.) Aqtedar Ahmed Siddiqui, Registrar of NUB were present on the occasion. State University of Bangladesh (SUB) organised a workshop on “Testing and Evaluation of Students” to prepare a guideline for testing and evaluation system for the students practiced by the Faculty Members of State University of Bangladesh on September 8, 2011 at SUB seminar room. Professor Dr Mijanur Rahman, Treasurer, University of Dhaka was present as chief guest while Professor Iftekhar Ghani Chowdhury, Vice Chancellor of SUB chaired the programme. Among others Maj Gen (Rted) Dr M Shahjahan, Treasurer and Advisor, School of Health Sciences, SUB; Professor A Y M Ekram-ud-Daulah, Registrar, SUB and Professor Dr Nazrul Islam, Dean, School of Business and Social Studies took part in the discussion. Professor Hamidur Rahman, Head, Department of English Studies conducted the whole programme. The orientation programme of the newly admitted students of Master of Public Health (MPH 7th batch) of IUB was held on September 8, 2011 at the permanent campus of the University at Bashundhara in Dhaka. Professor M Omar Rahman, Vice Chancellor (In-Charge) of IUB graced the occasion as chief guest. In his short speech Professor Omar assured the students that the university would do everything possible to ensure their dreams come true. "Make use of the available resources of IUB," he pleaded to the newcomers. Professor HarounEr Rashid, Director, School of Environmental Science and Management, Professor M Ali Hossain, Head, Department of Environmental Science and Dr Tanvir A Khan, Registrar, IUB were present, among others, on the occasion. 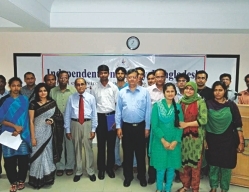 The orientation programme of the newly admitted students of M.Sc in Environment Management of Independent University of Bangladesh (IUB) was held on September 4, 2011 at the permanent campus of the University at Bashundhara in Dhaka. Professor M Omar Rahman, Vice Chancellor (In-Charge) of IUB graced the occasion as chief guest. Professor M Ali Hossain, Head, Department of Environmental Science and Dr Tanvir A Khan, Registrar, IUB were present, among others, on the occasion. Professor Muhammad Mahboob Ali, PhD, an eminent financial economist of the country joined the M H Business School of Presidency University. Professor Ali was appointed as head of the school. He served in Atish Dipankar University of Science and Technology as a Professor and Chairman and Proctor of Department of Business Administration and also worked as a Chairman of School of Business in Bangladesh Institute of Bank Management as a faculty member. Distinguished Economist, former Finance and Cabinet Secretary Dr Akbar Ali Khan joined BRAC Business School on September 11, 2011 as Professor. Dr Khan will be teaching business environment, business ethics and culture as well as drive entrepreneurship, corporate social responsibility and corporate governance related research programmes at BRAC Business School. A man of great personality, Dr Akbar Ali Khan carries a distinguished background with him including a PhD in Economics from Queens University, Canada and has authored many publications in support of his interest and commitment.